This pdf by John Wick Presents is 26 pages long, 1 page editorial, 1 page ToC/prelude, 1 page front cover, 1 page advertisement and 1 page SRD, leaving 21 pages of content, so what exactly do we get with these Orks (yeah, with “k”, just like in German!)? You have probably read the Wicked Fantasy-series of articles in Kobold Quarterly, but just to be sure: Wicked Fantasy centres on a new takes on classic fantasy races, a reimagining so to speak. An example would be the Uvandir, genderless (but male-looking), eternal dwarves who can toil all day and night, never starve etc. In this pdf, we get an expansive take on the Orks in the vein of a widely-expanded ecology-article. Thus, via the divinely-infused bloodlines, Orks changed and diversified and had to deal with the lifting of the red haze of rage, for now, they encountered a state of mind as of yet unknown – free will. The nomadic tribes have made tentative peace with the other races, as they seek to understand the powers their newfound freedom and the darkness of their ancestors blood offer them. Depending on the bloodline of one’s ancestors, special abilities and dispositions are available to the green-skins. 6 of these divine bloodlines are included. The Orks can also create so-called Feth’Ork-creatures by feeding animals and beasts their blood in order to mutate the critters into allies and negate the loathing regular animals exhibit when encountered by Orks. I mentioned the worship of pain as well and it defines Orkish culture to this date – their sacred scars, the Va, all come with their stories and knowing these has to be earned. More importantly, 5 masochistic feats enable Orks to harness the power of pain and actually get stronger via hurt, pain and punishment. I really loved these feats and while they seem to be kind of powerful, the steep price they demand is worth the benefit. 3 feats are focused on the divine bloodlines and we get a new mystery for the oracles, the so-called blood mystery, which essentially provides the tribal shamans and makes for a neat piece of writing. We also get a new archetype for barbarians and one for bards, the latter being rather interesting, as it focuses on insulting foes and bolstering allies via epic story-telling, thus hearkening back to our own world’s intricate webs of poetic allusions displayed in saga-literature and Heian romances like the Tale of Genji, to quote only two. Editing and formatting are good, though not stellar: I did notice about 7 glitches on my first read-through and an additional pass at editing would have been nice, as some of the extensive bookmarks consist of only one letter. layout adheres to a 2-column standard and comes in full-color, with a parchment-like background and neat pieces of artwork. I really liked the writing, which makes this pdf rank among the most compelling ecology-articles I have ever read. On the other hand, though, I feel that some of the pieces of writing like the feats could be more concisely-written: I had to re-read some of the feats before I got how exactly how the crunch is supposed to work. Were I to rate only the quality of the writing, I’d settle for a higher rating, but as presented the glitches and minor hick-ups just accumulated and thus I’ll settle for a final verdict of 4 stars. 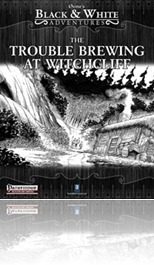 This pdf from 0one Games is 22 pages long, 1 page front cover, 1 page editorial/ToC, 1 page SRD, 1 page advertisement and 1 page back cover, leaving 17 pages of content for this b/w-adventure, so let’s check it out, shall we? As always, this being an adventure review, the following contains SPOILERS. If you’re a player, please jump to the conclusion! Further complications might arise due to the love between the local nymph and the leader of said group. The whole adventure is presented in a nonlinear fashion and should be considered a kind of sandbox that can fit many roles, from a resistance-base against a despot to almost crazy anarchists and even chaos cultists, the brewery offers some neat ideas. Not all is rosy, though: The map provides no key-less version to cut apart and hand out to players and the namesake brewery is actually a rather minor part of the complex: A bigger brewery with more environmental peculiarities and hazards would have been nice, as would a map depicting the connecting tunnel between the backdoor of the complex and the brewery. Seeing that this is essentially a set-piece, no truly intriguing story goes along this adventure, relying wholly on the DM to make this work in an exciting manner. Editing and formatting are very good, I only noticed 2 minor punctuation glitches. Layout adheres to the elegant 2-column b/w-standard and the quality of the b/w-artworks and maps is top-notch. The pdf comes with excessive bookmarks. This pdf is a bit hard to rate for me, as there essentially is nothing wrong with it. The idea of using a brewery is more than neat. However, I also feel it falls short of its own potential and by quite a stretch, but let me elaborate: The brewery, that is the rather innovative location of the adventure is only a side-location that barely figures into the covered ground when it easily could have been made into a truly unique, exciting location. To cut a long ramble short: The brewery is too small. While there’s nothing wrong with sandbox-style adventures, I would have also liked some more ideas to make an infiltration out of this venture instead of a slugfest. The fey-subplot doesn’t really go anywhere and could have easily made the brewery a much more alien, far-out and special place to explore. I also would have liked some advice on how to turn the opposition to the PC’s side, as the main antagonists are actually sympathetic characters I can see working with the PCs against some kind of tyrant after initial misunderstandings. These are just some ideas that have not been realized. This adventure, with perhaps 10 additional pages, could have been an absolutely epic place. Seeing the untapped potential herein, I’ll settle for a final verdict of 3 stars – an ok sandbox adventure that has painfully squandered the potential its location and antagonists offer. This pdf from Raging Swan Press is 23 pages long, 1 page front cover, 1 page advertisement, 2 pages of editorial, 1 page ToC/foreword, 1 page SRD and 1 page back cover, leaving 16 pages of content, so let’s take a look! The first encounter is actually a 4-room-micro-dungeon (including a map): Grave robbers have intruded into a cairn and now a cairn wight and a minor skeletal champion are rather disgruntled. Not long ago, Kyrim pain, hobgoblin mercenary, has created his own band and the PCs may actually encounter them and either fight or parlay with them – the hobgoblin comes with full NPC-information like distinguishing features etc. The next encounter provides a sample orc-tribe, including 5 sample stats – nothing to write home about, though. Especially when compared to the orcs of the eternal zenith. A patrol of dwarves also make for an interesting social encounter and provides extensive NPC-information for the members of the group. The next encounter in the pdf provides for a rather grotesque, yet lethal encounter – an inter-species relationship between an ogress (clr 8) and a hill giant (brb 2/ftr 2) has bloomed into a meat-grinding toll-operation that could make for an interesting and strangely romantic encounter. Ulwen and Phara, a merchant and his almost dead soldier companion Phara survived a raid, but only barely – the PCs will have to act quick and smart to save Phara and repair their wagon, hopefully guiding the traumatized merchant to safety. The final encounter has the PCs face off against wyverns with red dragon blood, which is guaranteed to be a challenge indeed. Editing and formatting are top-notch, I didn’t notice any glitches. layout adheres to Raging Swan’s 2-column standard and the b/w-artworks and little map are nice. The pdf comes fully bookmarked, with a version optimized for use with e-readers and a file of collated statblocks for your Raging Swan statblock-library. 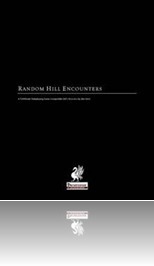 While 2 encounters (the ogress and her mate and the shambling mound) make for far-out, cool critters, the rest of the encounters left me rather cold and didn’t excite me – perhaps I’m spoiled by the absolute STELLAR Random Marsh Encounters, but in direct comparison, this installment by Ben Kent, while still a good offering for the low price, falls flat. my final verdict will thus be 4 stars – still an interesting purchase that shows a lot of promise. This installment of the FoTS-series by Rite Publishing is 13 pages long, 1 page front cover, 1 page editorial, 2 pages of advertisements and 1 page SRD, leaving 8 pages for the 3 incarnations of Khufusiris, so let’s check them out! As with my other recent reviews in the series, I’m going to start at the back and move forwards towards the high-CR-incarnation. Khufusiris begins play as an advanced criosphinx with the primordial simple template (CR +1) applied and CR 9. His mid-level incarnation is CR 13 and further adds the riven magic template (CR+2, included as well) and becomes able to break magic items , drain spells and be immune to magic. Ouch! Finally, his CR 17 high-level incarnation also gets the betrayer-template (CR +1). The write-up of the template in this pdf unfortunately lacks the CR-information, though. I found the CR+1 in the excellent Book of Monster Templates by RiP. An uncommon combat power-house, Khufursis, the dopey-smiling sphinx actually turns out to be a paranoid, delusional creature in its one-page fluff-write up and as always, the sphinx comes with full information for dreamburning as per the rules introduced in CM. Additional content is provided as well – 3 spells (one enhancing stealth, a phantasmal pit and the high-level illusion treacherous phantasm, which can’t even be broken by true seeing, as it clouds the mid of the victim. Oh, and there are feats: A lot of them: 7 feats are included in the deal and make the sphinx and interesting combatant to say the least – a combination of combat and monster feats makes sure that the creature can bluff and power attack like crazy and subvert the defences of its unwitting allies. My favourite piece of original content, though, would be the huntsmen’s Sigil: Auberyon and his best artists created this tattoo and it shows: Apart from some rather devious abilities, the sigil also makes it VERY HARD to land a killing blow against its bearer – an uncommon, cool and innovative legacy item that makes for an awesome price, should its bearer ever be vanquished. Editing and formatting are very good, apart from the missing CR-information in one template, I didn’t notice any glitches. The pdf adheres to RiP’s old rune-bordered layout and comes with full bookmarks. The b/w-artworks are fitting. 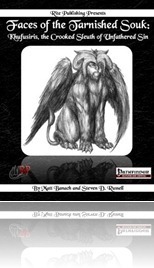 The authors Steven D. Russell and Matt Banach (Justin Sluder for the first time not being part of this installment) have created a rather interesting installment of the series – while the creature is interesting, it features no class-levels and all its power stems from distinct templates, items and feats, which is nice to see for a change. In fact, the feats and the sigil per se make up for the truly interesting components of the creature. Khufusiris does what he sets out to do, but nevertheless a distinct feeling of unrealized potential constantly gnawed at me and after careful consideration, I realized what it was: The motivation. The sphinx is a betrayer and survivor, yeah, but with some modification of the background, perhaps some additional pieces of information, the sphinx could have become a truly multi-facetted being, whereas the status-quo makes the beast feel rather one-dimensional and offers no true possibility of redemption/trauma that would explain its opportunistic paranoia. Thus, due to this and the minor hick-up in the table, I’ll settle for a solid verdict of 4 stars – a good installment of the series, but not one of its admittedly mind-boggling peak-performances. This pdf from Necromancers of the Northwest is 26 pages long, 1 page front cover, 1 page editorial, 1 page SRD and 1 page back cover, leaving 22 pages of content for the new steeds and stallions, so let’s check them out! After 3 pages of short story introducing us to the matter at hand, we are presented with more complex rules for horses – from feeding horses (grazing vs. hay and supplemental food) to stabling horses in different kinds of stables. We also get horse-quality templates ranging from nag over broken-down to average and high-spirited as well as charger. Even cooler, we get rather detailed tables of quirks for horses to give them personality beyond the standard, from sudden stops, to biting steeds, we get several quirks and associated value modifiers. Included is also a special kind of horse disease and new rules to govern horse races. While the templates are nice to have and add versatility to the horses, these new rules (introducing relative speed and stamina) are simple, easy to use on the fly and make for a cool additional usage for horses beyond the obvious means of transportation. In fact, a running battle on horseback could easily be pulled off via them. Speed is Str-mod+ Dex-mod+1d6+quality modifier, Stamina is Con-modx2+1d6+quality modifier. Players can use up to 3 points of stamina per round to boost speed. The GM rolls an open d6. Players roll one per point of stamina used and for each die equal to or above the DM’s result, they get +2 speed for one round. Each rolled result equal or below the GM’s result takes one point of stamina away from the horse for that race. Simple, fun, cool. Editing and formatting are top-notch, I didn’t notice any glitches. 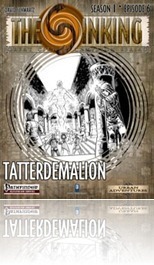 the pdf features the classic 2-column layout and used parchment-look of NNW, along some neat pieces of stock artwork. The pdf comes with extensive bookmarks as well as a printer-friendly b/w-version. 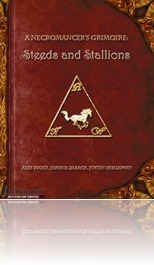 I really, really liked this pdf – the templates to horses make steeds more complex, the quirks grant them more personality and, especially when combined with 4 Wind Fantasy Gaming’s plethora of statblocks from Phantasia Zoologica, make sure that no two horses are the same. The additional race-rules make for a great and easy way to add them to your game, even on the fly. It is here, however, where the one major gripe with this pdf lies – It’s too short. It would have been rather easy to add e.g. chariots/carriages etc. to said rules or at least give advice on how to handle races with them. The lack of said rules makes the pdf fall a bit short of absolute excellence. My final verdict, though, will still be 4 stars and a definite recommendation to buy, especially at this low price-point. This installment of “The Sinking” from 0one Games is 17 pages long, 1 page front cover, 1 page editorial, 1 page SRD, 1 page advertisement and 1 page back cover, leaving 12 pages of content for this adventure. This being an adventure-review, the following contains SPOILERS, so potential players might wish to jump to the conclusion. A famous architect has gone missing and the PCs are hired to find him. Unfortunately, as their research shows, he was not only massively indebted to problematic individuals, but somehow, everyone talking to the PCs tends to wind up mutilated, beaten or even dead. Editing and formatting are ok, I didn’t notice any significant glitches. Layout adheres to a 2-column standard and the artworks and maps are top-quality. The pdf comes with full bookmarks. 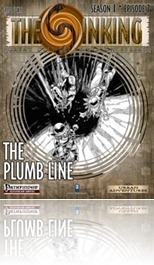 A combination of simple investigation, exploration and mini-dungeon, complete with a hand-out of the plumb line and a minor puzzle to figure out how to use it, this installment of “The Sinking” sets a precedent for what can be done with such a short little scenario – Tito Leati has created a nifty little scenario I can unanimously recommend. Thus, final verdict will be 4.5 stars, rounded up to 5 stars for the purpose of the platform. This installment of “The Sinking” from 0one Games is 15 pages long, 1 page front cover, 1 page SRD, 1 page editorial, 1 page ToC, 1 page advertisement and 1 page back cover, leaving 9 pages of content. This being an adventure review, the following contains SPOILERS. Potential players might wish to jump to the conclusion. Righty right, the Great City-adventures have provided some of the most exciting fêtes I’ve encountered in any written modules and the latent sense of aristocratic decadence reminiscent of the fin-de-siècle is one of the components I personally have always enjoyed about the setting. This particular installment of “The Sinking” fully capitalizes on the idea, as the PCs are hired to make sure a party of some decadent nobles goes smoothly – said party is to take place in a bathhouse (fully mapped, btw.!) right at the edge of the sink-hole. To add more complications, the bathhouse was supposed to be haunted, which develops a nice basic tension. The ghost of the bathhouse appears! Only, there was never a ghost, but rather a trapped water elemental and a rather powerful guttermage called Burlstaff has taken up residence here and taken the gem containing the element as the centre of his new shrine. The grumpy fellow doesn’t necessarily want to hurt the attending crowd or the players and might make for a social resolution or a very tight battle once the PCs see through his ghost-bluff. Of course, the panicking crowd can get itself into quite some trouble and in the end, it’s up to the Pcs to save the panicking youngsters. Editing and formatting were actually quite good – while I noticed a minor glitch here and there, I didn’t notice enough to rate this adventure down in and of itself. Layout adheres to the elegant b/w-2-column standard and the b/w-artworks and maps are top quality. The pdf is fully bookmarked. This particular scenario is rather interesting as it is rife with social complications and offers a nice twist on a rather creepy masque. The potential for the final encounter to be resolved without spilling too much undue blood is nice as well. I essentially have only one gripe – why not make the bathhouse be in danger of slipping over the edge/falling into the sinkhole? The angled bathhouse would have made for an exciting location and the natural disaster-component of “The Sinking” would have featured more prominently as well. Due to the minor glitches and said unrealized potential, I’ll settle for a solid verdict of 4 stars for this very affordable, neat little scenario. 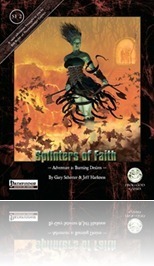 This installment of the “Splinters of Faith”-series from Frog God Games is 24 pages long, 1 page front cover, 1 page editorial, 1 page ToC, 1 page advertisement and 1 page SRD, leaving 19 pages for the ventures to the gardens of Iseleine. This being an adventure review, the following contains SPOILERS, so potential players might want to skip to the conclusion. Calamity has befallen the pacifistic paradise the followers of Iseleine have crafted for themselves in the midst of the lush Kajaani forest – In the midst of the woods, a huge, forested chasm looms and within, a vast pillar containing paradise-like gardens was erected ages ago – on it, the strange, non-violent followers of Iseleine wallow in their passivity, beauty and talk to plants while slowly losing their connection with normal life. The disturbing tranquillity of this place of solace has been disturbed by the high-priestess murdering her husband, flinging herself from the column into the gardens below and any search troops sent have not returned. Unfortunately, the priestess also had the sacred oil needed for the Scepter of Faiths on her. This adventure is cool, to be exact, my favourite among the Splinters of Faith series so far and that due to a neat idea: Obvious weapons, component pouches etc. may not be taken into the lush, tranquil gardens. Even worse, the followers and faith of Iseleine, with their crystalline sphere atop the temple that sprinkles and throws rainbows across the valley are inherently CREEPY. The perhaps best red herring I’ve read in quite a while, for the followers are truly naive pacifists – their high-priestess was killed and replaced by a succubus in disguise, who not only impersonated her, but also committed the murder. What starts as an exploration of the creepy temple swiftly turns into a search-mission in the lower gardens, where strike-squads of Derro currently undermine the column to send it crashing down, taking the eden-like gardens with it. It’s up to the PCs to stop the mad dwarves and their allies while not (openly) violating the tenets of Iseleine. Editing and formatting are top-notch, I didn’t notice any glitches. Layout adheres to the 2-column standard and the b/w-artworks/maps etc. rock. The exploration of the lower gardens should be tense, but once again no player-friendly map is presented, only one for the Dm with all the hotspots, making the exploration quintessentially dependent on the DM’s willingness to draw up his own map, which is a downer. The pdf comes with no bookmarks. This is by far the most iconic of the temples presented until now and makes for a STELLAR adventuring location. While the mystery plot is rather flat, it could be expanded easily to feature a more compelling story-line. The other gripe I have that mars an otherwise stellar writing is that, once again, we get no transition – no random encounters, no information on terrain, nothing for the journey between part 3 and 4, in spite of the continent map included in each installment. While I did really love this adventure, I also feel that aforementioned problems undermine its usability, thus making it impossible for me to rate it the full 5 stars. Instead, I’ll settle for a hearty recommendation and 4 stars. If you want to check only one of the first 4 adventures out, get this one. The 3rd installment of the Splinters of Faith-series from Frog God Games is 32 pages long, 1 page front cover, 1 page editorial, 1 page ToC, 2 pages of advertisement, 1 page SRD, leaving 26 pages of content, once again more than in the predecessor. This being an adventure-review, the following contains massive SPOILERS. Players might wish to jump to the conclusion! Rumours of undead amassing in the sewers have disquieted the high priestess and she wants, whoever might be responsible, stopped. What follows is a truly exciting exploration of sewers that fill with water due to the proximity to the ocean, tidal tensions, deadly foes and some rather neat maps, the latter of which unfortunately coming without player-friendly versions. The sheer iconic quality of the sewers (which I’d usually hate) is created by the fact that they are haphazard pipes and tubes connected to buildings that have been submerged by the pyroclastic flows of old and now stand at angles etc. – cool set-up, very good execution. Editing and formatting are top-notch, I didn’t notice any glitches. layout adheres to the 2-column standard and the B7w-artworks are nice. We get more content than in the predecessors, but still no bookmarks. This adventure is superior in its iconic settlement and dungeon to the first two parts and surpasses the second chapter (Burning Desires) via the fact that a player-friendly map is not absolutely necessary (and omitted, just like in “Burning Desires”). I still would have loved player-friendly maps in this as well, but their lack does not impede the adventure as much. Not all is well, however: The city Bargasport is extremely iconic and cool and quite frankly, feels a bit sketchy – a couple of pages might suffice for a village, but not for a full-blown town. The sections above ground remain rather amorphous and the unique properties of the sub-terranean areas (with angled buildings connected by pipes) could have been played up much, much more – the idea is great, I just don’t get why only so few things have been done with it – almost no balancing and climbing, no in-dungeon escaping from the rising tide (e.g. up a subterranean and soon also submerged tower) – it is just a terrible bummer to see such potential squandered – cut one or two of the standard run-of-the-mill encounters, replace them with challenges like that and there you – I would have rated this one much, much higher. We also still don’t get any kind of wilderness transition to the town, which constitutes a minor bummer for me as well. In the end, this one feels better than the first two installments, but my aforementioned gripes prevent me from rating this higher than 3.5 stars, which will be my final verdict for the module. For the purpose of this platform, I’ll round down. 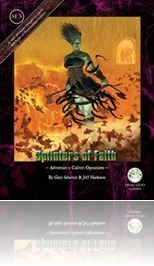 The second installment of Splinters of Faith from Frog God Games is 21 pages long, 1 page front cover, 1 page editorial, 1 page ToC and 1 page SRD, leaving 17 pages of content – quite a bit more than in installment number 1, so let’s check it out! This being an adventure review, it contains SPOILERS. Potential players might want to jump to the conclusion. Still here? All righty! After acquiring the shattered sceptre of faiths, the PCs have ventured to a Dwarven settlement named Anvil Plunge to re-forge the mundane parts of the sceptre in the blessed forge. Once again, we are introduced to an aptly-written village, this time a dwarven frontier-town loosely reminiscent of a wheel in layout, including 4 connected temples in the middle of the village. Once again, the settlement feels very much alive and unique and has its own feeling of fragility – after all, the village has recently lost the second of its holy relics (the first being an adventure-spanning side-quest) and the PCs will have to investigate the theft: While the theft per se is interesting, it’s depiction in the adventure is lacklustre at best, amounting to a perception check and some knowledge: The perpetrator is a druid, wildshaped, got through some drainage and stole the artefact (an ever burning piece of coal) from the furnace while protected from flames. The adventure could have easily been made more exciting with a better investigation. The thief, a half-orc cleric, hides in the sin-mire and this is where the adventure begins to shine, or could begin to shine: The PCs use a raft and glide through a mapped mire to find the entrance to the enemy’s lair. While the map is cool, no map for the players is provided, thus showing them that several islands contains the same creatures – a blank hex-map of the mire as a hand-out would have made this section plain awesome. Oh well, after exploring the mire (probably thanks to a DM’s hand-drawn version of the map), the PCs have to delve into partially submerged giant crayfish tunnels (a neat dungeon with over-and underwater sections), challenge the druid and return the coal to have the Scepter of Faiths re-forged. Editing and formatting are very good, though one location is missing from the wilderness map. Layout adheres to a 2-column b/w-standard and the artworks and map-qualities are high. The pdf has no bookmarks, which is a downer. This adventure provides a neat, unique village, a short investigation (that, as presented, does not deserve the name, but can easily be expanded) and a truly iconic wilderness and dungeon and this is where one of my two main gripes with this installment lies: The wilderness map. To run a free-form wilderness exploration, a DM NEEDS a map without letters denoting the hotspots and the adventure fails to provide one. The other gripe I have with this installment (and the whole series in general) is that no transition from installment I to II is provided – no wilderness, no random encounters, nothing! And the two villages are not exactly adjacent! Apart from that, this adventure provides more content, a better mood and a more iconic location to adventure in than part I, so my final rating will be 3 stars – if you’re willing to work, this might even be 4 stars for you.